We are a nonprofit supporting the healing and reintegration of our Wounded Warriors into civilian life. Who we are: We are a young and small but passionate and growing nonprofit funded by corporations such as Ball Aerospace, Ophir Corporation, and others, as well as individuals. We have a 501(c)3 nonprofit status by partnering with Outdoor Buddies, a 27 year old spin-off from Craig Rehabilitation Hospital in Denver. 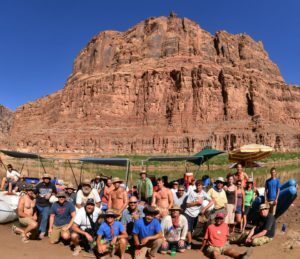 What we do: Warriors On Cataract Canyon sponsors 4-day whitewater trips on the Colorado River through Canyonlands National Park from Moab to Lake Powell for our disabled veterans. Last summer we were able to provide four trips, each taking about 25 Wounded Warriors, their caregivers and families on each trip. Why we do this: Each year over 6,000 veterans succumb to their hopelessness and depression and die at their own hand. This is more than have ben lost in 10 years of combat in the conflicts in the Middle East. This doesn’t have to be. We find that this whitewater trip is a watershed for many of the Wounded Warrior participants, giving them new hope and perspective, and forming a support group of other combat veterans, thereby putting them on a path to recovery and reintegration. Who we serve: We accommodate veterans with very significant levels of disability, such as PTSD, traumatic brain injury, orthopedic injuries, multiple amputations, burns, depression, substance abuse, and those with wheel chairs and service dogs.